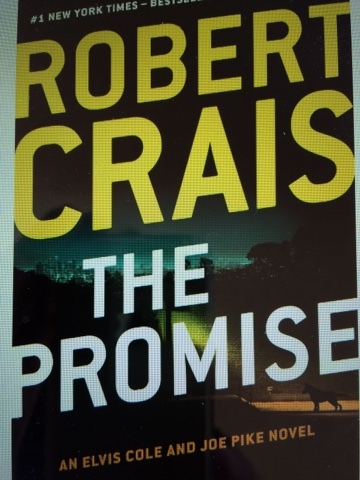 In The Promise, private detective Elvis Cole is hired to find a missing woman who allegedly embezzled money from her employer. As he delves into the job, he finds that the missing woman is involved with bad guys and may be selling plastic explosives to terrorists. Cole also finds that nothing is what it seems to be, except for his regular crew: Joe Pike and Jon Stone. 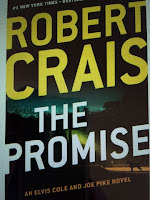 Is this the greatest Robert Crais book ever? No. It's fun to read, but a little thin. A number of chapters are told from the perspective of a police dog, who is a key character in the story along with her human partner. Additionally, lots of information about what makes dogs so effective in military and police work is woven into the book. This is an entertaining plot element, but it is not one rich in story, language or humor. Still, I enjoyed The Promise. The plot has many intriguing twists and turns. If you are putting together books for a vacation read, add this to the stack.